It's been a while since I've update my blog. That's for a couple of reasons... first, I've been super busy with other stuff and second, I haven't had much luck finding watches that I haven't already posted about. I guess after 450 models, it might get a little harder to post as often. Don't worry though, there were over 1,000 different models made before 1969, so I have plenty more to find. It's just going to get a little harder since I've done the most common ones already. One of my recent finds is a 1953 Robert. It was made for two years. 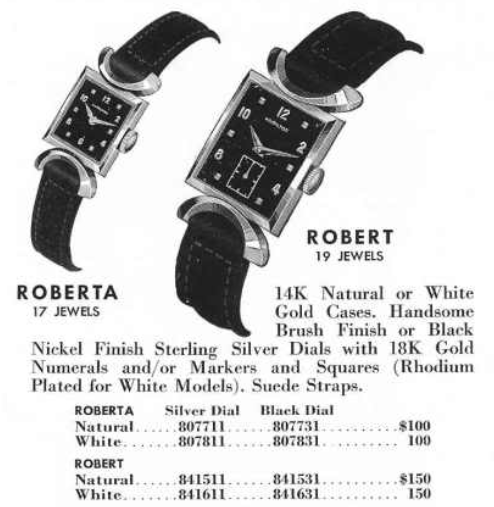 The Robert was part of a select group of models introduced in the 1950's that were paired with ladies models. The Robert's mate was the Roberta and they make a great his & hers set. 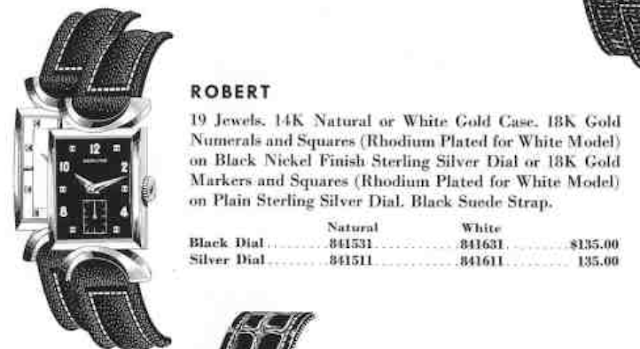 The Robert and the Roberta each came in solid 14K gold cases and you'll find them in white or yellow gold. They also came with black or a two tone silver butler finished dial. So if you like to collect al variants, there are four different Roberts to choose from. Tucked inside a Robert is a 19 jewel 12/0 sized 754 movement. The 754 was used only in solid gold cases. 14K gold filled cased models would get the 19 jewel 753 and the 10K gold filled models received the 17 jewel 752. Like most projects I receive, my Robert was in pretty rough shape. It would tick though - so that was a good sign. Without the beat up crystal in the way, you can see the dial is dirty but looks promising. It might just clean up, you never know. The movement has a frosted appearance. That's a clear sign that it hasn't been cleaned in a long time. Notice the color of the winding and ratchet wheels - they should be bright and shiny. You have a 50:50 chance of being able to identify a 1950's watch using the case back. Sometimes the model name is inside and sometimes it's not. Sometimes it's even wrong... for example, the K-455 often says Transcontinental A inside. But that's a different post. You can see ROBERT is stamped inside this case back, along with the requisite Hamilton Watch Co Lancaster PA. If you don't see Hamilton Watch Co (etc) inside the case back, it's likely not an original model... that's good to know when you're looking at platinum "top hat" models with 17 jewel 980 movement. One thing you don't see inside this case back are any watchmaker's marks. I wonder if this watch has ever been cleaned? The dial-side of the main plate shows evidence of a little water getting inside. That should clean up okay though. I happened to have a decent dial that looks to be a good candidate if the cleaning process goes awry. Actually, while writing this post I realized the seconds register isn't the same. I think the dial in the baggie is maybe for a Gordon? A new glass crystal will be a nice improvement over the beat up version that came with the watch. Everything is cleaned, dried and ready to be reassembled with fresh lubricants. The first thing to go back in is the mainspring, with a little grease to keep it well lubricated. The reassembled watch is now running nicely. After doing this for about 5 years I've started to get a sense for how well a watch is running just by looking at it. Well, I can see if it's not running well, lets just say it that way. This one is looking good but only the watch timer can really say for sure. Running nicely, as I suspected. Just a smidgen slow but that's easily corrected. Out of curiosity I looked at the back of the dials too. The one on the right is the correct model. Notice the dial feet are in differently locations. The one on the left is for a 14/0 sized movement like the 982. The dial and hands go on and then everything is tucked safely back in the freshly polished case. The new crystal and a nice croc strap complete the restoration. The dial cleaned up pretty well - it's not perfect but it's better than my unforgiving camera lets on. Definitely an improvement over what I started with - don't you think? Here's a photo of the same watch with a refinished dial. I think it looks much better. It's hard to get one of these two tone dials to be perfect as there is a lot going on with the two colors, various lines and hour markers. This one looks pretty sharp though, note how the lines are evenly spaced around the markers. Glad to see you back. The Robert turned out great. Nice looking model. Yes, glad to see you posting again...this is a very nice looking unique watch...great job as always.. Very happy to see you back. The Robert looks cool. Hope to see more of the harder-to-find models in 2016! Me too! Been quite a dry spell.